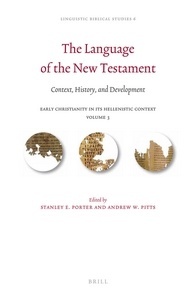 I am presently reviewing a volume entitled, The Language of the New Testament: Context, History, and Development (Leiden: Brill, 2013), co-edited by Stan Porter and Andrew Pitts. I have been enjoying the volume so far (though as with many academic monographs of this kind, the contributions are uneven in terms of substance, writing style, and ability to provoke interest). One bright spot has been Rodney Decker’s essay, “Markan Idiolect in the Study of the Greek of the New Testament” (pp. 43-66). I have taught through Mark several times in the past and I am currently in the midst of my course on Jesus and the Gospels. In both classes I discuss the distinctive nuances of Mark’s Greek style but (to this point) I hadn’t found an article to give my students on the subject that is both substantive and concise. Decker’s essay fits the bill. He discusses Markan parataxis, redundancies and dualities, multiple negatives, periphrasis, indefinite plurals, diminutives, use of euthus, the historical present, asyndeton, and anacolouthon. Those interested in such discussions will find Decker’s treatment useful. Wayne, I wasn’t aware he was doing that volume. I know he has a grammar coming out, which I intend to buy. Also, I really like his work and I love that series by Baylor. Thanks for making me aware of it. I will have to put it on my wish list. Decker’s essay sounds interesting, as indeed his book will be welcome. Another lucid and accessible discussion of Markan style comes in Nigel Turner, A Grammar of New Testament Greek, Volume 4, Style (Edinburgh, T&T Clark, 1976). This book was commended to me as a student, and I have valued it as a teacher.